What does a live/make space look like? We are not talking about a live/work place, or a makerspace out in the world. 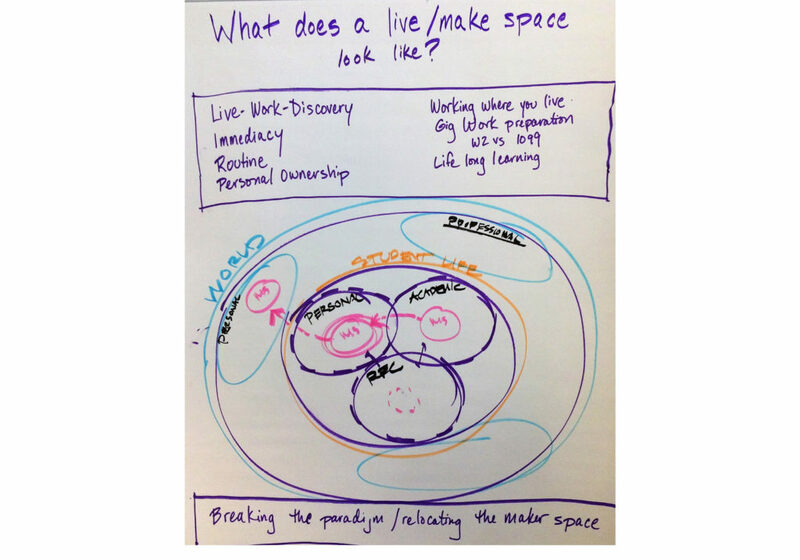 We are asking what might a makerspace be like if you live and work in the same place? Our justification for this question is reflected in the list of items on our poster. We want to know what life/work/discovery is. We talked about the close proximity of your makerspace to your living space, so you could roll out of bed and begin to implement an idea as opposed to getting dressed and eating breakfast, before going out into the world with your public face on before you begin making. How might it be different when a space for making is part of your living routine, when you have personal ownership of the space, when the space feels more like yours and less like one that belongs to the institution?